FOOTBALL: A record-breaking 12th straight English Premier League win has consolidated Chelsea's spot on top of the ladder. The Blues are seven points clear of Manchester City after breaking a club mark for successive victories. 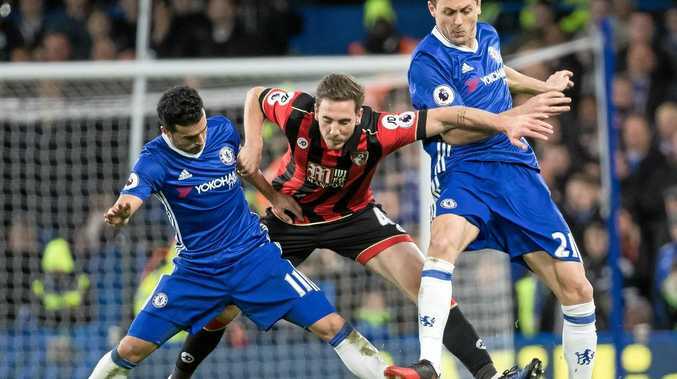 They will lead the ladder into the new year after a double from Spanish forward Pedro and a third from the penalty spot from Eden Hazard sealed the success over Bournemouth. The victory took Chelsea past its 11-game winning run from 2009, leaving Antonio Conte's men within two of the top-flight record set by Arsenal in 2002. "To win 12 in a row is not easy in this league. It's a fantastic run but it's important to continue that now," Conte said. "We have another tough game (at home to Stoke on Saturday) and we have to prepare very well because, now, every team wants to beat you." Chelsea has 46 points to the 39 of Manchester City, which won 3-0 at Hull City. The bottom club did not make it easy for City, which did not break the deadlock until the 72nd minute when Yaya Toure scored a penalty following Andy Robertson's foul on Raheem Sterling. Substitute Kelechi Iheanacho made it 2-0 before Sterling's cross was turned by Curtis Davies into his own net in stoppage time. "In the first half we forgot where the goal was, in the second half our strikers saw the goal a bit more and after the first goal it was easy," City coach Pep Guardiola said. Arsenal joined Liverpool, which plays Stoke tonight, on 37 points and is on fourth on goal difference after a late winner from substitute Olivier Giroud earned a nervy 1-0 win over West Brom. Sixth-placed Manchester United kept in touch and piled more pressure on former manager David Moyes with a 3-1 defeat of Sunderland at Old Trafford. Daley Blind opened the scoring before Zlatan Ibrahimovic slotted the second with eight minutes to go, his seventh goal in eight games. Henrikh Mkhitaryan's spectacular strike sealed United's fifth straight victory before Fabio Borini grabbed a last-minute consolation. Leicester City's struggles continued with a 2-0 home defeat by Everton. The loss left the reigning champion just three points off the relegation zone. Swansea City is second from bottom after another dismal defeat, this time a 4-1 thrashing at home at the hands of West Ham United. It was the fifth time in six matches Bob Bradley's team has conceded three or more. Burnley edged away from the danger zone with a 1-0 victory over Middlesbrough and Sam Allardyce's first match as Crystal Palace manager ended with a 1-1 draw at Watford.